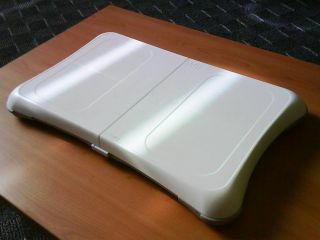 Wii Fit launches today - jump aboard! Nintendo's Wii Fit balance board - careful not to slip! Mad Catz, the gaming peripherals specialist, is set to launch a new range of Wii Fit add-ons, following the launch of Nintendo’s latest must-have Wii title today. First up, we have the Wii Fit Rechargeable Battery Pack, so you won’t have to keep buying expensive batteries for your balance board. Not the most exciting gaming peripheral ever, but highly useful, nonetheless. For those intending to travel with Wii Fit, the Wii Fit Travel/Storage Case carries your balance board, software and accessories, while the Wii Fit Exercise Mat adds increased stability to ensure your balance board doesn’t go slipping across your shiny wooden floor! Finally, the Wii Fit Protective Silicone Cover protects the unit from damage and scratching. What it doesn’t do is protect you from becoming addicted to yoga and, by extension, eating granola and drinking ridiculous green goo (otherwise known as wheatgrass). Darren Richardson, President and Chief Executive Officer of Mad Catz commented, “Wii Fit is yet another example of how gaming continues to grow in an organic fashion, providing a compelling experience for the entire family. Mad Catz is delighted to further enhance this innovative release with a range of useful and eclectic accessories which we feel will prove enticing to consumers everywhere”. While cynics dismiss Wii Fit as little more than a ‘yoga game for girls’ one thing is for sure – demand for the product is incredibly high, with the keep-fit game having already sold out in the UK. Wii Fit is out now, go and grab it as soon as you can, should you be able to find one anywhere.